Our goal is to provide cats and their human families with the best radioiodine facility in the Chicagoland area. We are currently the only facility offering this treatment within the city limits. Hypurrthyroid Treatment for Cats, located within Cat Hospital of Chicago, is dedicated exclusively to the use of radioiodine in treating hyperthyroid cats. Every single team member working with your cat truly loves cats – and every one of us enjoys working with cats of all shapes, sizes, and personalities. We recognize that your cat is a beloved member of your family – as ours are for us. We treat your cat like family. We are an American Association of Feline Practitioners designated Cat Friendly Practice, which means that we have gone the extra mile to assure that we understand cat behavior, and that we individualize the way we handle every single patient based on what works best for that patient. We respect the rights of every cat under our care to be handled with gentle hands and a soft touch, in a quiet setting. When examining or medicating a patient, we move as slowly as is needed for each patient in order to minimize stress. Your cat needs a time out part-way through the examination? We get that – and we respect your cat’s wish to have a time out. We understand cats, and we know that how a cat is, or is not, handled in the veterinary setting is critical in assuring a minimally stressful visit for the patient. We are also not hesitant to administer anti-anxiety medications in order to help patients better acclimate to their temporary hospital surroundings when needed. Cats are housed in our lead-lined radiation room for the duration of their stay. The radiation area is away from the busier area of the hospital, and it is very quiet. And of course there are no barking dogs! Hiding area (a favorite for most cats in a hospital setting because cats feel more secure when they not so visible to sight; or, better stated, when they think they are out of sight!) Many patients are more inclined to eat, drink and be cozy when they are ‘hidden’ and not so visible to anyone in the room. For cats that want to be let out for stretching, petting, playing while hospitalized, we will accommodate as fully as we can, given safety laws that we must follow. As much love as we’re safely allowed to give them! We provide daily updates on your cat while he/she is hospitalized. Routinely, we send pictures either via email or text, whatever your preference may be. 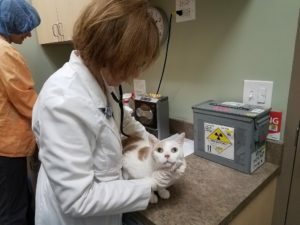 The doctors and staff are available for consultation after your cat is released from the hospital if you have follow up questions or concerns after your cat is back in the comfort of his or her own home.